Have a Local Business? Claim or Update Your Google My Business Listing, Now! If you have a business, you very likely have a Google My Business Listing. Your listing appears when people are searching for your business or businesses like yours on Google Search and Maps. Claiming or improving your Google My Business Listing is the singular, most important step you can take for your local business if you want to maximize results from Google Search. The keyword in the previous paragraph is “manage.” There is little a business can control when it comes to Google. When Google makes it easy to post correct information about your business for free, and that information is displayed in Google Search results and on Google Maps, you should take advantage of it. You also can see insights on how customers searched for your business, and their locations at the time of search. You can also see how many people called your business directly from the phone number displayed on local search results in Google Search and Google Maps. Bottom line: Claim and/or update your Google My Business listing! It is unequivocally the best and least expensive online marketing you can do. Does your business depend on travelers or local customers? If the answer is yes, you need to take a look at your Yelp listing. While you may never have heard much about Yelp, it can be very important to you if you have a business that relies on transient and/or “local” business. Nearly every Google, Bing, or Yahoo search for a “local” business returns listings that include one or more Yelp listings in the results. That is especially true if the search is done on a mobile device. How important are those people using mobile devices? A “Local Search” study recently released by comScore, Neustar Localeze and agency 15 Miles, reveals that “78 Percent Of Local-Mobile Searches Result In Offline Purchases.” ComScore also observed, “Nearly half of all service, restaurant and travel searchers were looking for a business they have never made a purchase from before.” The implications and importance should not be overlooked or undervalued. Yelp’s listings are often near the top of local search results. One of the reasons is their reviews. In addition to being prominent in Google search results, Yelp provides reviews by its “Yelpers” for Apple Maps, as well as listings and reviews on Bing, and since February of 2014, Yahoo. Yelp also signed a deal with Yellow Pages. The agreement allows YP to enhance its customers’ business listings on Yelp, and expand their distribution within the YP Local Ad Network to include Yelp’s vast audience of consumers. Reviews are arguably the most important element of Yelp. Google, Bing, Yahoo and other search engines are paying more and more attention to and using “social signals” (in varying degrees) when ranking search results. Of those “social signals” the importance of reviews is significant. The number of people talking about your business and what they are saying has an impact on how well your web pages rank in search results. If you have a business, especially one with a physical storefront, you likely have a Yelp listing. Don’t take a chance that they have your business information correct. Claim your business listing, so it is displaying as you would have it. I should note, they will likely try to upgrade you to a paid account. It is not necessary for a basic listing. You will have to make your own decision about the value of upgrading. Of course, Yelp is only part of the equation, there are at least six other major players when it comes to Local Search. You may read about them and find links to where you may update your local listings in our earlier blog post, Take Control of Your Local Search Listings Now! Don’t put it off. Update your Yelp listing today. In this increasingly mobile world with the rapidly growing use of phones and tablets, attracting the attention of prospects and your current customers is essential. Google Offers | For Business can help bring customers to your door. We all know that offering coupons and discounts will drive foot traffic to stores. With Google Offers, consumers can find, use, or save offers to their Google account. Google has made it easier to find Google Offers on mobile devices with their new Google Maps and Google+ apps. Consumers can simply click or tap the ‘Get offer’ button to save the offer and use it in stores. Your offer can reach customers on Google Maps when they are searching for places nearby or looking for local businesses like yours. Your business will be prominently displayed with a blue tag icon next to it, alerting customers to your offer. Google Offers shows your offer to customers based on their location, what they like, and what they’re looking for. You’ll only pay when a customer saves your offer. When a customer saves your offer, Google brings them to your door by sharing an offer reminder when they are near your store. 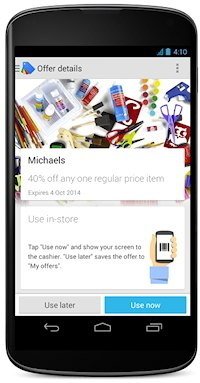 Google will help remind them when your offer is expiring too, through email and mobile alerts. 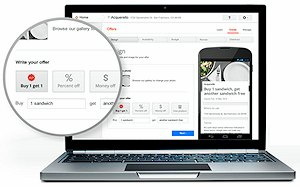 It is simple to redeem your Google Offers. The holiday season is nearly upon us. Take advantage of Google Offers today! Google Local Search Results “Carousel” Display was rolled out last week for desktop users. Some iPad and Nexus tablet users have seen this new look since December, but now it will significantly impact a much wider audience and a larger number of local businesses. 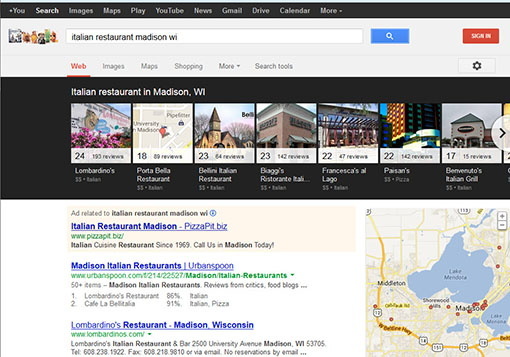 Here is an example search for Italian restaurants Madison, WI; you will see results similar to these. Google says “searches for local dining, nightlife, hotels, and other attractions” will display carousel results. Try it for yourself to see what displays in your area. The “carousel” is interactive, so we all know that those businesses, restaurants in this case, with the most attractive photo or logo are very likely to be clicked on first. How do you get your business photo there? It all starts with your Google Places Listing, which we have written about previously. If you currently have a Google Places page (where you can upload photos, your logo, business hours, etc. ), Google wants you to “upgrade” to a local Google+ page (some of you may have already done that). There are some advantages including the ability to understand customer feedback and respond to Google+ Local reviews. In an upcoming post, I’ll write more about the somewhat confusing two types of Google Places pages, help you understand the differences and the actions you can take to maximize your visibility in local searches. Five Reasons You Should Claim Your Google Places Listing, Today! If you have not, and many of you have not, claimed your Google Places listing, here are five reasons you should claim your Google Places listing today! In today world of Google’s Universal Search results, nearly every time a potential customer does a Google search that contains your community’s name (or the region where your business is located) and the type of product or service you offer, they will see a Google map with pins on it, and a list of businesses represented on that map. Is there a pin for your business there? There is no easier nor quicker way to improve visibility in Google SERPs, than claiming, and using your Google Places listing. 3. Make sure your listing is accurate and thorough. Did I say thorough? You may add photos and videos; custom categories like your service area, brands you sell and how to find parking; and coupons to encourage customers to make a first-time or repeat purchase. Google and prospective customers both love customer reviews. You don’t have to do many test searches using Google to see that websites of companies who have several reviews on their Google Places pages, do very well in Google SERPs. 5. It is easy, and takes a very few minutes. You may verify your phone number, address, and add business hours. After you have claimed and verified your Google Places listing, you may go back and take advantage of the features. Now, go claim your Google Places listing!